Of all the school subjects we try to cover in a day, science is often the one that can get shoved to the bottom – and sometimes off the list entirely. Don’t even talk to me about science experiments. They always sound like such good ideas while the lesson plan is being made. But when it comes to executing it, somehow the act of coming up with vinegar, twist ties, or a bar of soap seems like a daunting task. I don’t think this is just my family. I’ve heard this is struggle from others too. And it’s not just a home school thing. When I taught at a public elementary school many years ago before our boys were born, we focused on reading, writing, and math – trying to squeeze science in as we could. So what about that fourth out of four boys? That one’s going on 10 (happy birthday this week! ), and still needs quite a bit of our guidance and instruction throughout his school day. This is fine, and between Matt and me, along with occasional help from older brothers, he gets his work done. But science? It gets shoved to the bottom if no one has time to spend working on it with him. Now that it’s Christmas season? Have mercy. Well, I’m excited to share a little idea I tried that is working marvelously. Three words for you: Magic. School. Bus. We have several Magic School Bus books that we’ve read throughout the years with the boys, and Malachi really loves them. 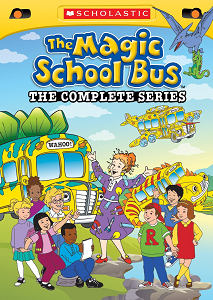 But right now, we’re pulling out our Magic School Bus videos – watching one episode each day. Talk about a fun way to learn science! And guess what else? About the time we ran out of our own videos to watch, we discovered that there are episodes on Netflix. Malachi gets it set up by himself, and we’ve got a 25 minute science lesson right on the screen. What else can often get shoved to the bottom of the list during a busy day? Exercise. So what have I been doing while we’re watching a Magic School House episode? I’m on my rebounder getting my heart pumping and working up a sweat while Ms. Frizzle takes us on an adventure through the solar system or digestive tract. It’s been perfect. I’m so excited and thankful that this has been working for us as a way to accomplish these tricky-to-work-in daily tasks. It’s been great for conversation, as these videos bring up quite a few lessons that are applicable to everyday life. What are you thankful for this Gratituesday? Leave a comment to share! We’ve really enjoyed the Apologia series as well! With 2 days to go before our 5th baby will be born, I’m feeling so grateful for so much. His grace is sufficient! Question. The apologia science series – is there anything similar to that in a non-textbook format? ps – we made your peanut butter chocolate chip bars last night and the kids loved them. I’m so thankful that a cancellation allowed us to get an appointment at the neurologist THIS afternoon instead of the three week wait that is typical. His seizures have been crazy, and it will be a blessing to be seen so soon! Today I am grateful for getting through an entire step class! Hooray for the affordable YMCA down the street! I am grateful for the support we’ve had through the hardest, craziest fall I could ever imagine. My MiL was diagnosed with terminal cancer, then my FIL died and now she is starting hospice…all since August and none with any warning…they are 71, so young! But God and friends are with us through it all! And we are gifting the Magic School Bus kits (one comes each month) to our kids for Christmas….now to use them!